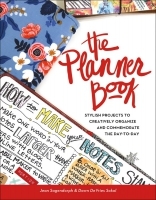 The Planner Book! is the perfect source of inspiration to introduce you to the world of planners. Featuring interviews from more than 20 creators, the book is full of ideas to spark your creative and keep you organized. With 24 projects, from simple tricks like making your own washi tape to more ambitious projects like crafting a leather planner, you’ll soon have the best looking to-do list around. Getting organized has never been this fun or this cute! Step aside scrapbooking, everyone’s planning for a new adventure! Now folks are stamping, painting, collaging, and even creating their own planners. It’s one part organization, one part art journal, and two parts keepsake.